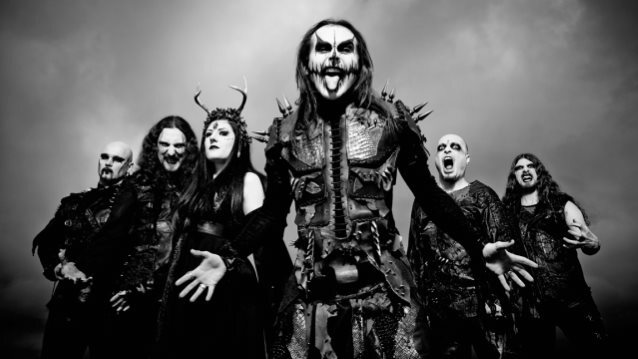 "Hammer Of The Witches", the eleventh studio album from British extreme metallers CRADLE OF FILTH, will be released on July 10 via Nuclear Blast. A track from the CD, "Deflowering The Maidenhead, Displeasuring The Goddess", can be streamed below. 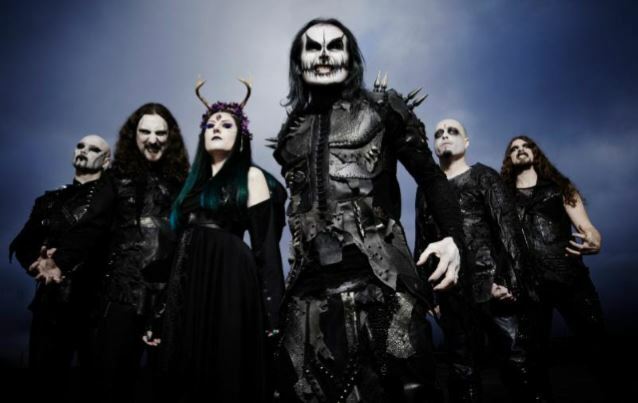 Comments CRADLE OF FILTH frontman Dani Flith: "'Deflowering The Maidenhead, Displeasuring The Goddess' is based on the ancient belief of the world personified as Mother Goddess, concerning itself with her self-preservative measures when assailed by her final abuse by the human race. Violated, poisoned and unknowingly left for dead, Gaia's is a pre-emptive, violent and justified retribution; without tears for creed or culture. Nature versus Mankind. A total renewal of species. The song spirals onward at a frenetic, apocalyptic pace to climax and was originally one of guitarist Ashok's contributions to the album, along with 'The Vampyre At My Side'." "Hammer Of The Witches" will be made available on jewel case CD, limited-edition digipak, mail-order edition and 2LP vinyl. Regarding the "Hammer Of The Witches" cover, Filth said: "The artwork for 'Hammer Of The Witches' was created by Latvian artist Arthur Berzinsh and is a lavish walk-through of the lyricism, drawing on rich renaissance themes and displaying them in beautiful-yet-unsettling scenarios. Half of the detailed pieces are totally original for the release, others are Berzinsh classics cunningly tailored to the themes of the album, which are themes rife with heady witchcraft, be it persecution, retribution or unfettered spiritual liberation. The female form is rampant throughout the artwork, unashamedly displayed in its classical rendition of beauty... and horror." Arthur Berzinsh is best known for his defiant neo-symbolism raster graphics and oil paintings, postmodern interpretations of classic myths and refined hooliganism in the playground of contemporary art. He has been proclaimed as a "sacred monster of Latvian postmodernism." And rightly so, his visually expressive and mannerly works tend to trigger emotions which can make thoughts fidget and wriggle, unable to find a comfortable position among the impressions gathered. His creative work is characterized by a varied range of voluptuous erotica, intensified imagery, dream-like scenes and decorativeness weighed down by visual metaphors and contrasts teetering on the edge of symbolism. Arthur Berzinsh explains his artwork and concepts: "In terms of mood, I was looking for the inspiration of this set in the spirit of Faustian romanticism, the ambivalent art of renaissance that reanimated motives of pagan mythology after the Middle Ages, and, of course, the darkly beautiful and charming spirit of Goetia traditions that is filled with the atmosphere of hermetical rituals. "My personal conceptual leitmotif that inspires me is a conflict between the free-thinking and totalitarianism, where the raw power always gains the upper hand over individualism. "The act of art is a theurgical act that creates existence in the Platonic reality — reality of ideas. So, at least in this Platonic dimension let’s give the suppressed ones a chance to get their revenge. "For me, the Goat of Mendes on the cover symbolizes the scapegoat who's tired of his humiliating role and wants a payback. This character is an archetypical symbol of libido and other primordial forces and instinctive aspects of a human being. And these forces always have been a menace for those who want to reign over the others, like it's schematically represented in George Orwell's '1984'." 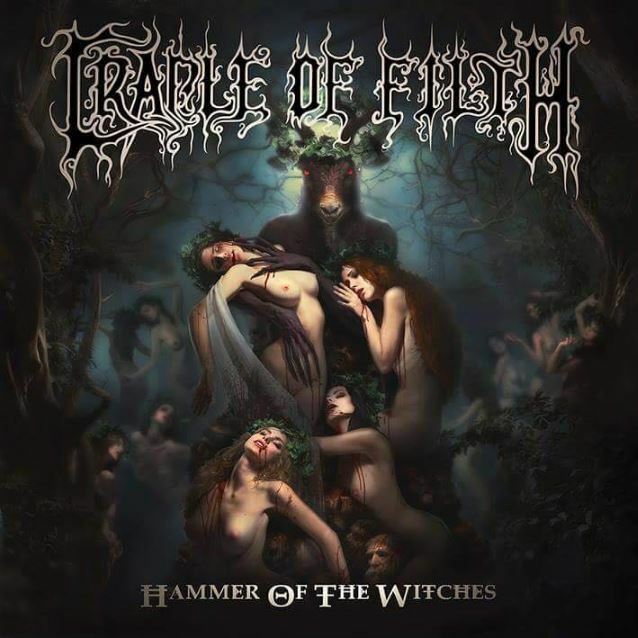 "Hammer Of The Witches" will mark the first release with CRADLE OF FILTH's new lineup, which includes new guitarists Ashok (of Czech groups ROOT and INNER FEAR) and Richard Shaw (of English acts EMPEROR CHUNG and NG26).